Participants vote for the funniest joke in Cincinnati during a closing event on Feb. 23. "I managed to collect about 226 jokes in total and they were all quite different," Lindsey reports. She expected to receive a fair number of dirty jokes, especially since she was giving out her phone number so people could text her jokes as they thought of them. "There wasn't anything too questionable within that. There were a few slightly more dirty jokes but nothing outrageous, which I thought was interesting since I was giving people the freedom to submit any joke they wanted anonymously." 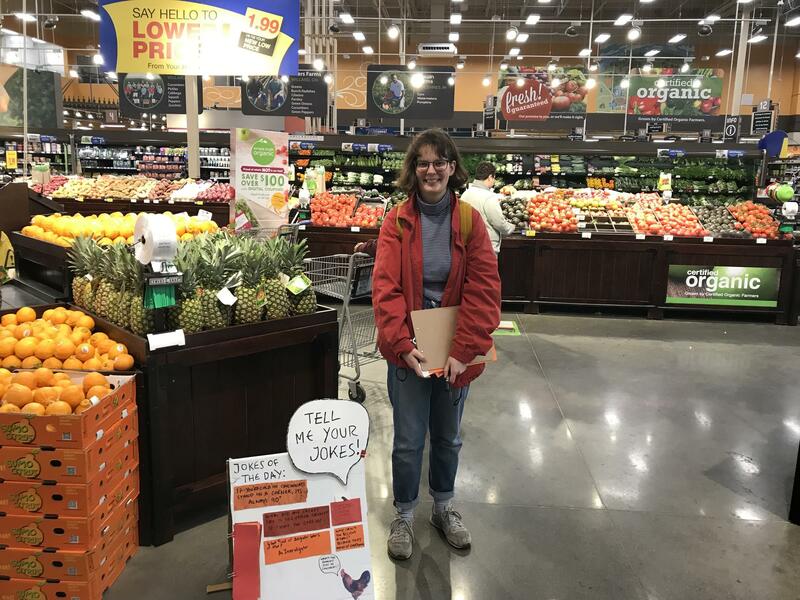 Artist Sophie Lindsey took her mobile joke booth around Greater Cincinnati hunting for the funniest joke in town. A few people were indignant when told about the article naming Cincinnati America's least funny town, but most found the project humorous and engaging. In true Midwestern fashion, "other people were quite accepting of [the article] and said, 'Yeah, that sounds about right,' " Lindsey says. As the project evolved over its five-week timeline, Lindsey created a collage of all the jokes. At the conclusion, participants and community members were invited to view the collage and vote on the funniest and least funny jokes. Runner Up - If you're cold in Cincinnati, stand in a corner, it's always 90 degrees. "This was actually one of my favorite ones," Lindsey explains with a laugh. "It was told to me during the Polar Vortex so it was even more appropriate." Winner - What's the difference between a petri dish and the USA? In 300 years, one of them will develop a culture. The joke voted the least funny isn't fit for public radio. Suffice it to say that it's a meme about a 2007 Brazilian fetish film that generated a viral video. Lindsey is still thinking about compiling a pocket joke book with the results she gathered in Cincinnati, but it isn't completed as yet. Since the voting was subjective, she wonders if the outcome might have been different given more time and additional voters. "I think there's a lot of other potential for the project that could be developed in the future," she says. John Schroeck delivers jokes during a comedy night held as part of artist Sophie Lindsey's funniest joke project. Lindsey says the project helped her build confidence in herself that she can take on big projects that involve engaging with strangers. She saw some participants make similar strides, too. 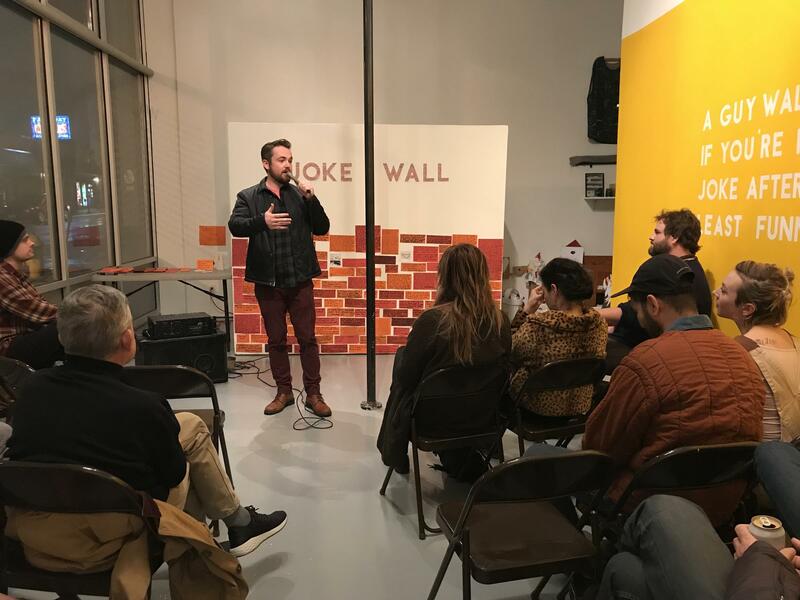 One man said he had never done standup comedy before, but he writes lots of jokes. Instead of telling them, he leaves them in his email's draft folder. She encouraged him to come to an open mic night and tell a few. "He came and prepared a set and it all flowed together," she says. "Giving him the confidence to think 'maybe this is something I could do in other places as well' was really cool."